Video clip synopsis – The 1956 Melbourne Olympics took place at the height of the Cold War. Tensions between the USSR and the USA threatened to derail the Games. Cold War Games is an excerpt from the documentary Lies, Spies and Olympics produced in 1999. The 1956 Melbourne Olympic Games have become etched in Australian mythology as a watershed in the nation’s sporting, cultural and civic history. But behind the myth is a far more revealing story: an epic saga of lies and petty bickering during the lead up to the Games that almost saw the IOC take the Games from Melbourne. It’s also a dramatic political story, during which the goodwill of Melbourne was undermined by Cold War skulduggery, defections and even murder—extraordinary events involving the highest offices of Australian Olympic and political power. A Film Australia National Interest Program in association with Rob McAuley Productions. Produced with the assistance of the Australian Broadcasting Corporation. How did the Australian government respond to the threat of communism after W11? Following the Second World War a small group of Victorian amateur athletes, with less than seven pounds in their bank account, dreamt of bringing the Olympic Games to Melbourne. Against all odds, they realised their fanciful dream and the Games of the XVI Olympiad became a watershed in Australia’s sporting, civic and cultural history. Behind the myth of the 1956 Olympic Games is a far more revealing story – an epic saga, spiced with petty squabbles, lies and broken promises, that created world news during the lead up to the Games, and almost saw the IOC (International Olympic Committee) strip them from Melbourne. After years of crises, the most prestigious international sporting event in the world finally went ahead for the first time in the Southern Hemisphere. The opening ceremony was hailed as the most impressive ever staged. But it was the height of the Cold War and tensions between the USSR and the USA threatened to derail the Games. Behind the scenes, the Melbourne Games were nearly undone by superpower skulduggery, defections and even murder involving the highest offices of Australian Olympic and political power.Tensions between USA and USSR have obviously defined later Olympic Games in the 1980s but already in 1956 they threatened to derail the Games from the outset. The eruption of violence in the Water Polo final between USSR and Hungary was accompanied by Australian and USA government offers of asylum to Hungarian athletes. The increased tensions were reflected in the presence of Australian soldiers in the Olympic village and the suspected murder of a Hungarian intelligence informant by USSR ‘agents’. Note details of the Suez crisis. Note the role played by Australia. Result? Note USSR actions at the United Nations. Implications? Note details of the Hungarian Uprising. Note the response to the arrival of the USSR team in Melbourne. Note the international reaction to the USSR involvement. Note what finally distracted everyone from these problems. What evidence is there that USSR ‘secret agents’, the KGB, were active in Australia in the 1950s? Why was there a crisis over the Suez Canal in 1956? 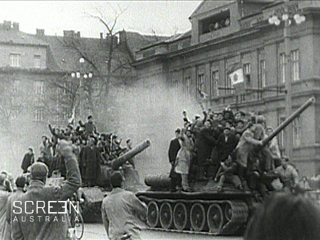 Why was there a crisis in Hungary in 1956? Write a report on the Cold War crises of 1956. Draw a Venn diagram that compares the ancient and modern Olympic Games. Explain why there were international tensions at the Melbourne Olympics.